Halley has over 20 years of experience as a professional dancer, actress, and practitioner of yoga, Pilates, and assisted Thai Yoga. Experiencing the benefits of Pilates in her own body, Halley enrolled at the Kane School of Core Integration, studying with Kelly Kane. Halley’s career as a dancer and actress has taken her all around the country performing in musical theater. As a movement professional who has been studying and working with the body her entire life, she brings both an intellectual and intuitive understanding to her teaching. 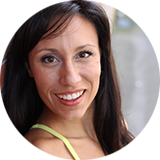 She loves to help clients get centered and release into the restorative aspects of a Pilates practice, and of course lead you through a challenging, well-aligned, and healthy workout. With training in assisted Thai yoga, she incorporates this knowledge and practice into sessions as well. She is passionate about helping you meet your goals and helping you feel GOOD and find greater health and wellness! Pilates Mat and Equipment, Creative workout with Pilates’ props, optimal alignment for greater ease, comfort and flexibility and incorporating yoga practice into Pilates’ workouts. I believe my greatest accomplishment thus far is building and sustaining a career as an artist in NYC, and booking a great job at Bay Street Theatre and joining the AEA Union. Health is everything! It affects our feelings, our thoughts, and who we believe we are. Not only do I feel personal health and exercise are important, I feel that it’s really important to find a trainer who can help you connect to and find joy in movement. Movement is healing, living, giving, and I find intentional movement with a connection between mind/body to be THE MOST FUN!! This is the kind of exercise that can bring joy and health for a lifetime. As a dancer, I understand the downside of “beating up” one’s body, and I’m therefore passionate about the power of connecting to and caring for oneself through sustainable, conscious exercise. I am attracted to openness, playfulness, a desire to grow and learn, and a bit of well-placed wit and sarcasm. I spend a lot of my free time taking dance classes and voice lessons, practicing Pilates, yoga, and the occasional Barre class. Of course I enjoy spending time with family and friends, reading, and I love to go to the theater. Hiking and travel, especially at the same time are my other passions! I think vivacious describes me best – I have a lot of energy, and I love to use it to play and to radiate positivity. My training work, in helping others, brings me a lot of joy. I’m pretty thrilled to be here on this planet, and to be part of the Barefoot Tiger team, changing lives – one Pilate’s pushup at a time!